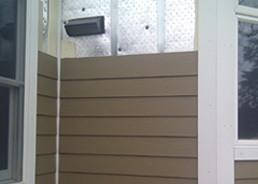 Rain screen technology is a modern innovation that is quickly becoming the preferred method for preventing rainwater from entering exterior walls. Rain screen technology is already promoted heavily as a “Best Practice Solution” by industry experts and in recent studies commissioned by Federal agencies such as HUD and the U.S. Department of Energy. Rain screens work hard to keep moisture at bay, with technology that sheds most of the rain and manages the rest. Because any wind-driven moisture drains away, condensation no longer forms behind the siding. It’s simple: by keeping exterior walls and insulation dry, moisture cannot invade and cause premature decay. The hollow-back construction pioneered by Furring-MasterTM provides a gap that’s central to this system. Besides ensuring maximum drainage, this design allows proper venting so moisture dries faster than ever. Furring-MasterTM won’t trap moisture or become brittle with age. Without question they are superior to wooden furring strips or plastic battens. Furring-MasterTM is guaranteed for 50 years. Screened trim adapters keep the air moving. The vent facilitates maximum air intake and exhaust, and its screen component reduces insect infiltration. 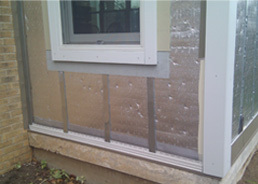 Equalized pressure means less air infiltration into the building. An intentional gap between the exterior sheathing and cladding hosts a mid-layer of air around the building. By allowing the building’s outermost air pressure to equalize with the exterior atmosphere, this transitional layer eliminates the large pressure difference between a building’s interior and exterior, which is otherwise common. Since external air can no longer enter the building when it hits the cladding, the walls are as air tight – and as energy efficient – as possible. Any water that makes it past the cladding will drain and dry quickly. 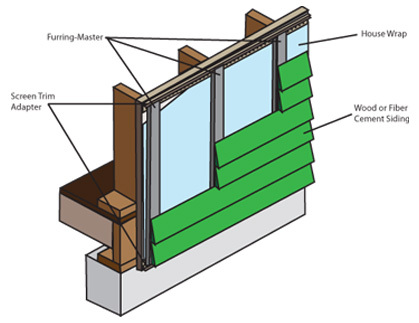 No cladding assembly is entirely impervious to the elements, but with the vented rain screen, any water that may enter will swiftly drain down the Water Resistive Barrier and out the bottom. Any remaining dampness will dry quickly thanks to the air gap behind the cladding. These superior drainage and drying essentials keep moisture from infiltrating the wall’s assembly and prolong the life of the building, no matter the type of cladding used. An extra layer of air keeps the building cooler. In most exterior walls the sun hits the cladding, which is in direct contact with the sheathing. The result: the sun’s heat travels an easy path directly from the cladding into the walls, heating the building. With Rain Screen Technology, the transitional mid-layer of air impedes the transference of heat; keeping the wall’s sheathing, and therefore the building, much cooler. Patent Pending hollow-back construction facilitates maximum drainage and accelerates drying. Strong A.S.T.M. 20/22 gauge G-90 galvanized U-Bar steel furring strips straighten imperfect walls. Perfect sized gap of 1/4” does not add to the cost of building out window and door openings. Will not crack, split, burn, rot, or trap moisture, unlike wood furring strips. Will not crush and cause a wavy appearance, unlike more expensive mesh rain screens. Recommended by James Hardie Siding, a national leader in innovative fiber cement siding solutions. Offers a true capillary break. 50 year service life guarantee.